I did manage to find two radios for my collection at the 2010 Charlotte Antique Radio Conference. The first one is a really nice Atwater Kent model 20 Deluxe. I bought this set from the Ernie Hite estate auction. I really wanted something from Ernie's collection but was well aware the I couldn't afford any of the really high end sets he had. Then while I was sitting next to Brad Jones our auctioneer recording the sales, here comes his AK20 Deluxe. I remember being with him at Rochester when he bought it. I had been looking at it and really wanted it but was getting close to running out of money. When I told the seller that I'd pass, Ernie stepped up and said he'd buy it. I've had a AK20 Deluxe in my collection for nearly 30 years but it wasn't very nice. As a matter of fact when I first got it, it had been "antiqued" orange. but this was the first one I'd ever seen for sale and it was a good price. of the flat areas just fine, BUT down in all the cracks and seams it stayed put. I finally gave on years ago. and it came from Ernie's collection. The second set I brought home is a little more unusual. 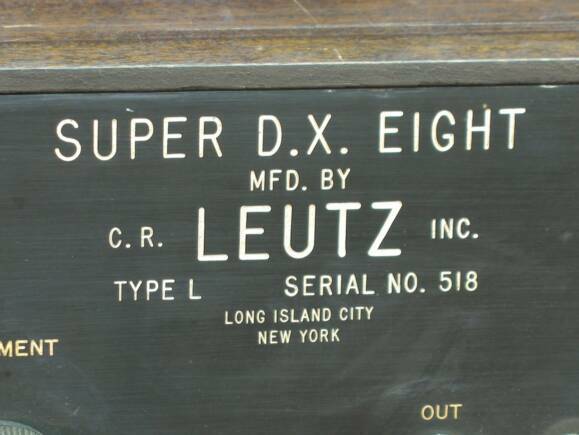 You may know of my interest in Leutz super-hets. The star of my collection is a 1922 Leutz model L.
Saturday morning while going through the Flea Market a freind directed me toward a battery super-het. It was in a little to rough a shape for me so I passed, the seller asked if I had seen his Leutz model L. After I picked my chin up off the pavement I said WHERE. He pointed to a set next to the one I was just looking at. that are each 40 inches long making a completed setup 80 inches long. super-het that used 199 tubes. The photo below shows the neat square buss wiring. modified back in the 1980s by Phil WEINGARTEN. 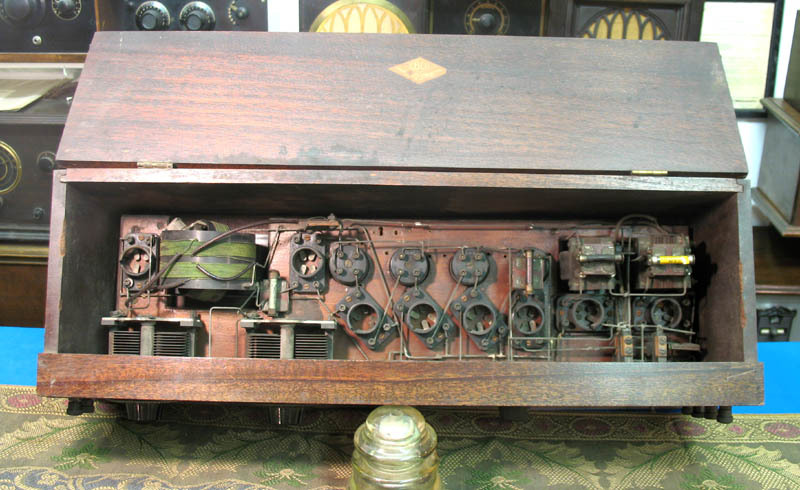 Phil was well know for making fake tube, telegraph gear and radios. and the rest of it makes a great story.